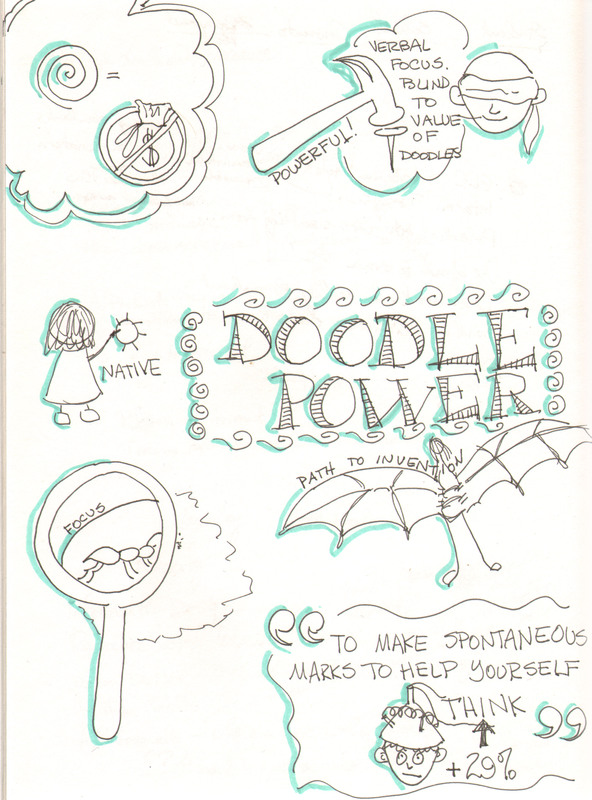 Here’s my sketchnote from Sunni Brown’s Doodle TED talk. I loosely used the tic-tac-toe format but it seems way too open and empty to me. Needs something to bring it together. What is that thing? Oh, and if the images aren’t appearing for you, just click the title of the post. Not sure why that’s happening. I’m becoming pretty happy with building my symbollary but I still struggle with the final page layout. 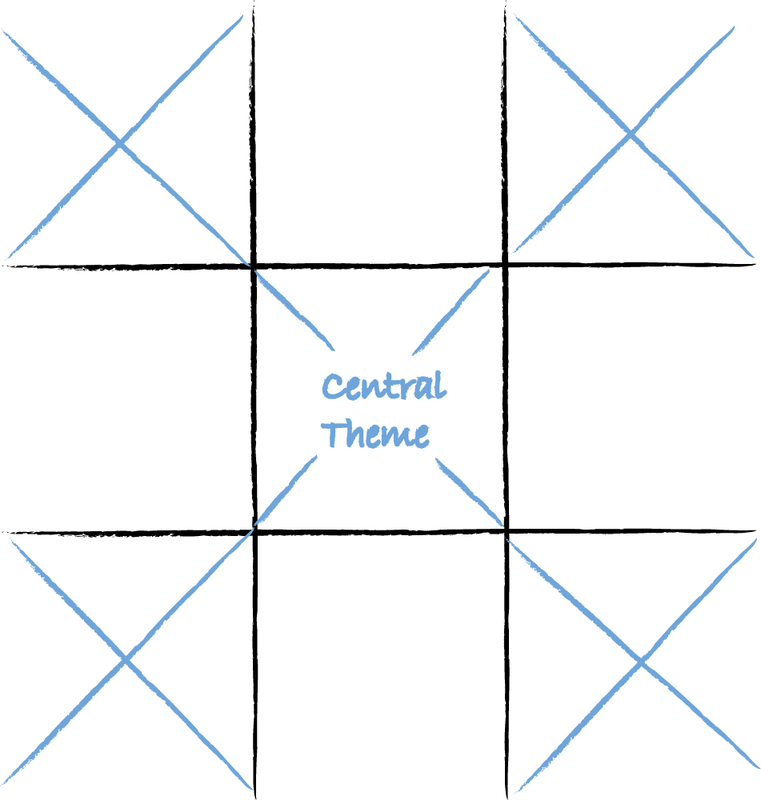 I’m going to try this one next time, where the central theme is the middle of the page and the outside X blocks are the main points. It will force me to open up the space a bit, I think. I’ll try it on Sunni Brown’s TED talk and see what happens. Why don’t you try it too and email me your results? We’ll have a gallery. Yes, I know that you prefer lurking but just this once, let’s engage? Wanna see your sketchnoting become mainstream? Here’s a TED talk about the doodle revolution led by Sunni Brown. Hey, maybe we should Sketchnote it!!!!? So did you notice? Eva Lotta Lamm uses a light colored marker to shade around her black and white notes. I bought several light colored markers but find myself using the light gray brush marker most often. And I keep finding new things to shade. 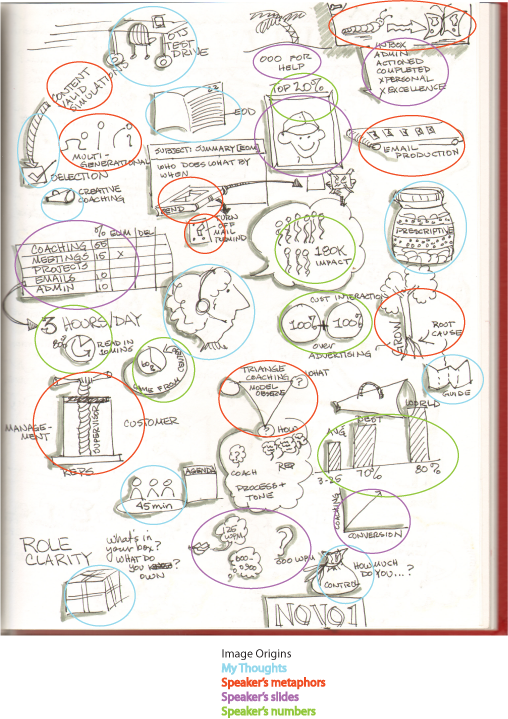 Look back at the conference Sketchnotes. What color will you use? Talk about imagining a future! My next learning discovery is a big duh! Why didn’t I tell you this before??? Because when you are in the midst of something it’s hard to think about your thinking. Eva Lotta Lamm’s suggestion is to capture only the essence of a talk when she Sketchnotes. Hey, I didn’t say they were all my discoveries! When I translate “essence” for myself, I say, “resonance.” I listen for resonance — what is the speaker saying that resonates with me? What did I hear that I care about? That’s what ends up in my drawings. Let’s take this bit of text from an earlier post titled Learning to Fly. I underlined what resonated with me but what will you underline? Find the essence. And then draw based on your essence. What else do you notice? It’s tip #3. 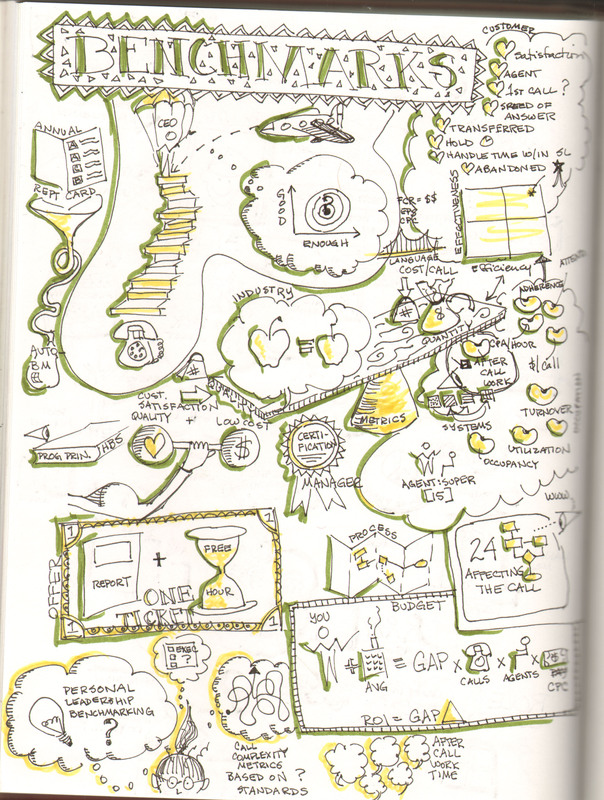 Where do Sketchnote images come from? 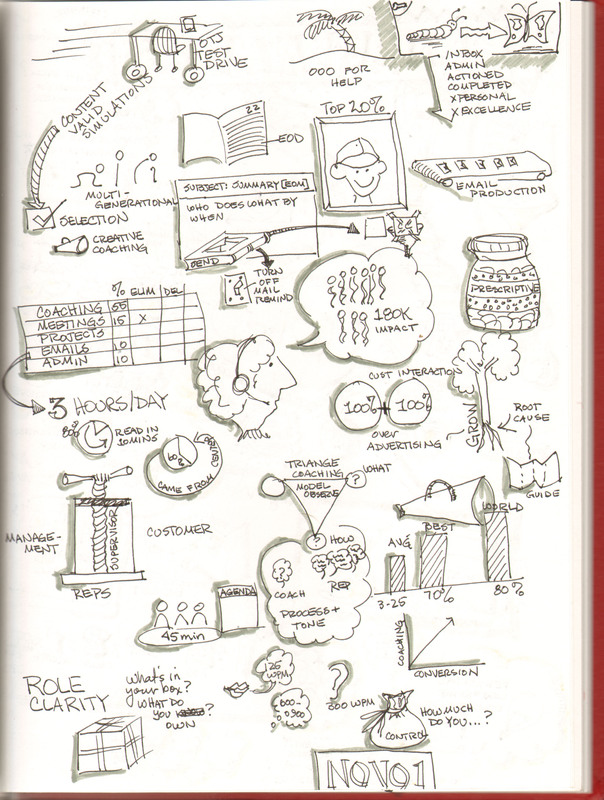 Here is an annotated version of one of my recent Sketchnotes, showing the source for each of the images on the page. I found four sources. See what you think. Are there others that you piggyback off of? How would you draw piggyback? Yesterday I attended a call center conference. I sometimes work on call center training. Yesterday, I also realized something interesting about call centers. They seem to focus more attention on leadership than most of the other business areas that I have worked in. It’s an interesting mix. In my experience, they are often rigid hierarchical structures where employees are micro-managed and regulated to death. The structure often seems parental. Actions are prescriptive rather than thoughtful and organic and situational. That said, my experiences are relatively few. But it also makes me wonder what the difference between a call center with a high leadership quotient and my experiences might be. But again, I digress. I wanted to share a couple of note pages from two talks that I attended. 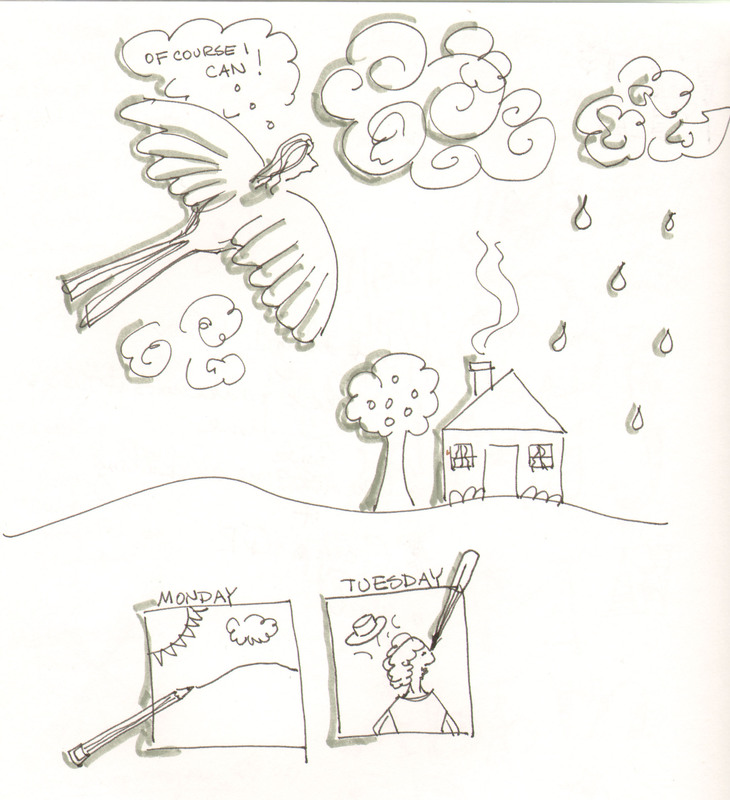 These pages demonstrate 4 recent discoveries regarding Sketchnotes, that I will share with you in come upcoming posts. See if you can see what they are. And Stay Tuned. I thought this was a great quick tip to improve facilitation. I always knew that holding uncomfortable silence was a strong factor in active facilitation. This quick tip suggests an actual time to hold. Read the 9-second pause rule here. http://trends.masie.com/ And try it out the next time you’re eager for a response to a question, even if you’re only holding a conversation.